Guangjun Liu, professor in aerospace engineering, builds robots for the aerospace industry, space exploration and the manufacturing sector. (PhysOrg.com) -- At first blush, it may not seem like robots and aircraft control systems have anything in common. When you put them together, however, you arrive at the core of Guangjun Liu’s unique research expertise. 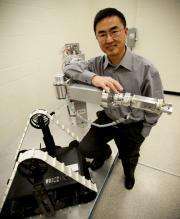 A professor in aerospace engineering, Liu is a Tier 2 Canada Research Chair in Control Systems and Robotics. As part of his work, Liu is solving problems that confound the aerospace industry and negatively affect the success of space missions. Along the way, he is helping to maintain Canada’s position as an international leader in robotics and aerospace engineering. During the last two years, his research team has had 17 research papers published in peer-reviewed academic journals. Those articles provide unmistakable proof of the groundbreaking work happening in Liu’s lab. There, industry-supported research is helping to build modular, reconfigurable and expandable robots from scratch. Compact, light and versatile, those robots have multiple applications and promise to make a major contribution to the aerospace industry, space exploration and the manufacturing sector. For example, in addition to lifting heavy payloads, the robots in Liu’s lab will ultimately be able to handle hazardous materials and carry out dangerous rescue and security operations. Liu is working on two projects aimed at improving on-board control system for aircraft. The first initiative involves “bleed air” - compressed air that’s taken from jet engines to provide cool, fresh air to the cabin. Liu is studying ways to make this system more efficient, thereby reducing drag and using less fuel. Liu’s second project, sponsored by Honeywell, seeks to improve on-board electrical power systems. Those systems are used in flight control, cabin-environment control, engine and flight management, computer and communication, passenger services and in-flight entertainment. In fact, arcing was implicated in the 1998 crash of Swiss Air Flight 111. The horrific accident, which happened mere kilometres off the shore of Peggy’s Cove, N.S., killed all 229 passengers. To help avoid future tragedies, Liu’s team is developing innovative techniques to identify and diagnose problems in electrical systems. The research is expected to improve the safety and reliability of aircraft, and to help maintenance workers better determine which equipment requires upkeep at what time. In addition to his research successes, Liu also takes pride in his lab-based teaching responsibilities. Twenty-five of his former graduate students now work for such well-known aerospace companies as Honeywell, Bombardier, and Pratt & Whitney.